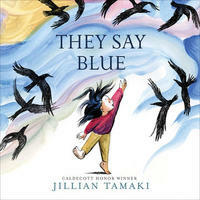 Jillian Tamaki is the winner of this year’s English-language Governor General’s Award for Literature for Young People (Illustration) for her gorgeous book They Say Blue. The peer assessment committee says "They Say Blue is a wonderful blend of words and art, a sweeping, joyous book from cover to cover. Its lively and dynamic compositions are sure to captivate both children and those who love to read to children. Wonderfully uplifting and imaginative, it spans an entire range of emotions and colours and makes one’s heart sing." Jillian Tamaki is a cartoonist and illustrator from Calgary, Alberta, who now lives in Toronto, Ontario. She co-created the highly acclaimed graphic novels Skim and This One Summer with Mariko Tamaki, and is the creator of the teen drama webcomic SuperMutant Magic Academy and Boundless, a collection of short comics for adults. She has won many awards for her work, including a previous Governor General’s Literary Award (in 2014), a Caldecott Honor, a Printz Honor, the Eisner Award, and an appearance on the New York Times Best Illustrated Children’s Books list. A working illustrator since 2003, she has also taught students of all levels at Parsons and the School of Visual Arts in New York City. Trevor Corkum: They Say Blue follows a young girl as she “contemplates colours in the known and the unknown, in the immediate world and the world beyond what she can see.” Was there a particular moment of inspiration that led to They Say Blue? 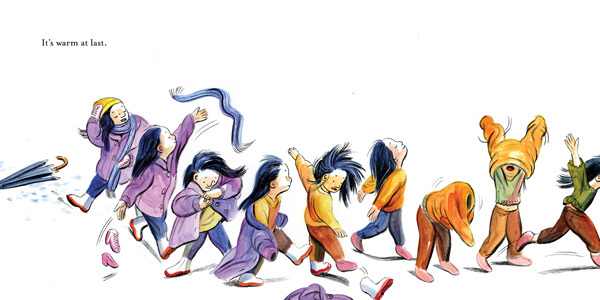 Jillian Tamaki: On the face of it, the book is about colour and nature, but it was actually the idea of motion that launched me into the story. I saw a dance performance choreographed by Sook-Yin Lee that featured a very kinetic little girl. She was jumping and running and whizzing around—it was incredible. When I got home I drew a picture of this dancer that depicted her in various poses overlaid—it had a stop-motion effect, but in a single image. It’s so fun to study those sorts of images and make them move in your mind. That seemed to hold some potential for a picture book. I realized later that I’d done more or less the same sequential-image idea in Skim and This One Summer (my graphic novels with Mariko Tamaki). Haha. Whatever gets you to the next phase, I suppose! So then I had the idea of movement. But what does she move through? I thought it could be moving through her everyday life, but observing it deeply. The story is really about perception and thinking. TC: What’s your own favourite colour? JT: This has shifted through time and context. When I was a kid, I loved green. I wouldn’t say that’s my favourite colour now. I like wearing black. I find myself using purple a lot in my work. A lot of colours have strong cultural associations (think: pink, grey, brown, etc), purple seems oddly open-ended for some reason. Which is funny because I used to viscerally hate purple and now I love it. Same with that very very deep blue—reflex or Klein blue. I used to really dislike it but now it’s one of my favourites. 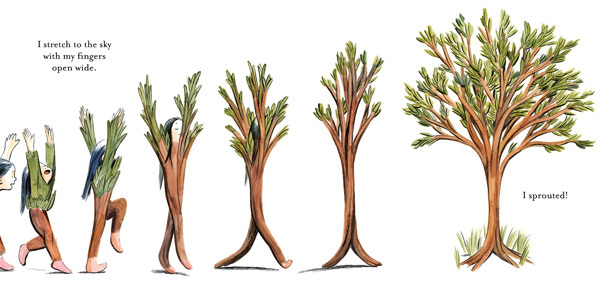 TC: An illustrated children’s book is a particular act of creation—so much wonder and mystery must be told through the illustrations themselves. What challenges did you face with telling this particular story? JT: Yes, it’s such a distilled, compressed form. The words and pictures are very heavily weighted. It’s a lot of pressure, especially given that ideally the book will be read dozens and dozens of times to the child! I find that with comics, I fall back onto a way of drawing that I liken to “handwriting”—it’s most important to be able to “read” the picture. It doesn’t actually need to be too fancy. With illustration, it’s a bit more like trying to bottle a rainbow. I enjoy that challenge but it can be incredibly difficult too. It still needs to feel fresh. TC: What’s your litmus test for great stories for young people? Oh geez. I don’t know. I think it’s not so different from adult books or movies or anything else. I think as long as it’s not cynical and speaks to the author’s truth, it’s fine. I’ve long accepted that not every book is for every person. Entering Picture Book World, I’ve noticed there is this discussion of “kids” like they’re a monolith. Kids like this, kids are like that, etc. But there’s all sorts of different kinds of kids. I take some comfort in that. I was worried I was going to have to play a ukulele at school visits. Entering Picture Book World, I’ve noticed there is this discussion of “kids” like they’re a monolith. Kids like this, kids are like that, etc. But there’s all sorts of different kinds of kids. I take some comfort in that. I was worried I was going to have to play a ukulele at school visits. TC: 49th Shelf is built around a large community of readers and fans of Canadian literature. What Canadian authors are you reading these days? The Marrow Thieves, by Cherie Dimaline; Sister Mine, by Nalo Hopkinson; She of the Mountains, by Vivek Shraya. On the comics front, Anti-Gone, by Connor Willumsen; A Western World, by Michael DeForge; Dumb by Georgia Webber, I’m Not Here, by g.g. ; Condo Heartbreak Disco, by Eric Kostiuk-Williams, Somnambulance, by Fiona Smyth!